The FGSD-910HP, a new member in the PLANET 802.3at PoE Fast Ethernet Switch family, provides 8-port 10/100Mbps 802.3at / 802.3af Power over Ethernet + 1-Gigabit Port with a total of 120 watts of PoE budget, which is an ideal solution to fulfilling the demand of sufficient PoE power for network applications with Fast Ethernet speed transmission. 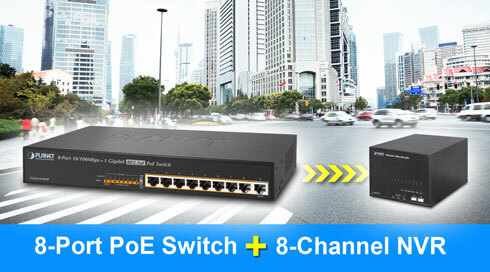 The eight 802.3af / 802.3at PoE ports feature PoE power injector function which is able to drive 8 IEEE 802.3af compliant powered devices or 3 IEEE 802.3at compliant powered devices. The FGSD-910HP also offers a simple, cost-effective and non-blocking wire-speed performance. It comes with a 12-inch metal compact housing, suitable for desktop deployment in SOHO office or department network application. Different from the general IT industrial PoE Switch which usually comes with 12 or 24 PoE ports, the FGSD-910HP provides eight 802.3af / 802.3at PoE ports for catering to small scale of IP Surveillance networks at a lower total cost. The FGSD-910HP comes with high performance switch architecture and 120-watt PoE power budget. The recorded video files from eight PoE IP Cameras can be powered by the FGSD-910HP and saved in the 8-channel NVR system or surveillance software to perform comprehensive security monitoring. For instance, one FGSD-910HP can be combined with one 8-Channel NVR and eight PoE IP cameras as a kit for the administrators to centrally and efficiently manage the surveillance system in the local LAN and the remote site via Internet.